In my recent posts I have examined the evidence that there are two closely related sweet spots that matter to athletes: the sweet spot at which the training load is just right to produce peak performance and the sweet spot at which training load is optimal to maximize longevity of both general health and running performance. In those posts I also examined the question of the possible close relationship between these two sweet spots – a relationship suggested by the evidence that similar or even identical processes are responsible for both the effect of training on performance and the effect of training on health. The processes common to both effects come under the general heading of inflammation – the complex set of biochemical processes by which damage to body tissues mobilizes either repair and strengthening; or, if opportunity for recovery is inadequate, leads to chronic inflammation, deterioration in performance and perhaps even to sustained ill health. Although our genes might play a part in determining the training loads at which these sweet spots are to be found, there is good reason to believe that both of these sweet spots can be moved to a higher level (that is, to a higher training load) thereby improving peak performance and improving health. However to do this we need to understand more about the mechanism of the training effect and about the nature of inflammatory processes. We also need to understand more about monitoring recovery. I touched on these issues last week and will return to them in the future, but meanwhile, it is crucial to consider a third sweet spot: the sweet spot in the mind. Any exploration of what distinguishes an Olympic gold medal winner from the finalists who did not reach the podium usually comes up against the evidence that there is remarkably little difference in physiology – in measurements such as VO2max or anaerobic threshold or muscle strength or blood hemoglobin levels. We know that all of these peripheral physiological measurements are relevant to athletic performance, but it is difficult to escape the conclusion that the distinction between the champion and the other finalists is more subtle. It is probably to be found in that most subtle and complex of all the components that make up a human being: the human mind. Recognition of the role of the mind in elite performance has provided a powerful boost for the discipline of sport psychology, but I am afraid that I am almost always disappointed by the writings of sports psychologists. In comparison with the subtle wisdom of a good coach, the simplistic wisdom of many sports psychologists is about as impressive as the simplistic notions of a scientist who tries to explain human behavior on the basis of observation of lab rats, in comparison with the illumination of the human mind provided by a great novelist or playwright. The mind is far too complex to be reduced to simplistic notions such as the power of positive self-talk – despite the fact that there is indeed a grain of truth supporting the power of self-talk. Positive self talk is directed at enhancing self-belief but for many of us, something more subtle than positive self-talk is required to establish strong self-belief. However, just because the mechanisms of the mind are too complex to be reduced to a few simple principles does not mean that we can safely ignore it. In fact the power of the mind matters not only for the aspiring Olympic champion, but for any competitive athlete and indeed for any recreational runner who simply runs for enjoyment and good health. One of the most intriguing hypotheses regarding the role of the mind of the athlete is Tim Noakes theory of the central governor: a mechanism within the mind (or the brain, since mind and brain are two sides of one coin) that acts to limit physical output so as to limit the risk of damage to the heart and other muscles. While the details of the nature and role of the central governor remains a topic for debate, the core idea that the mind sets limits to exercise tolerance seems to me to be established beyond dispute. A simple but graphic confirmation was provided in a recent study by Macora and Staiano from Bangor University: ‘The limit to exercise tolerance in humans: mind over muscle’ (Eur J Appl Physiol. 2010 Mar 11. [Epub ahead of print]). They required a group of fit young men to cycle at 90% of VO2max (an average power output of 242 watts) until the point of exhaustion; the point at which they could no longer maintain that power output. This point was reached typically after about 10 minutes. They then asked the young men to attempt immediately to produce the maximum power output possible in a five second burst. The peak power achieved during this five second burst was 731 watts, which is more than three times as large as the power output during the sustained test to exhaustion. This of course is no surprise to anyone who has ever sprinted at the end of a marathon, but it clearly documents the fact that our mind sets limits on the power output our body can achieve, according to the expected duration of the demand for effort. There are many strands of evidence linking the mind to the benefits and harms of training. As I mentioned a few weeks ago, the fitness and health benefit of exercise can be influenced by what you believe about the potential benefits. But perhaps even more relevant to the notion of the sweet spot in the mind is the observation that serial measurements of maximum power during an anaerobic test might be a fairly reliable measure of over-training. The Wingate test is a well recognized test of anaerobic capacity. The participant is required to produce maximum possible power output on a stationary bicycle during a 30 second burst. A power output of 690 watts is typical for the average male and 450 watts for the average female. A very fit male athlete might achieve a value over 1000 watts. This value is usually regarded as a measure of the anaerobic capacity: the ability to produce energy from the ATP and phosphocreatine energy systems. In an over-trained athlete, peak output in the Wingate test falls. For example , former medical director of the British Olympic Association, Dr Richard Budgett reports a study in which the peak power achieved during the Wingate test was reduced from around 1150 watts to 850 watts in over-trained athletes (BMJ 1994;309:465-8). While it is perhaps possible that the loss of peak anaerobic capacity in the overtrained athletes was a direct reflection of loss of biochemical capacity of the muscles, the evidence from Macora and Staiano’s study of the influence of the mind over muscle in which the limit on peak power was set by the mind, makes it far more likely that the decreased anaerobic capacity recorded in over-trained athletes is actually due the protective role of the mind. Thus if we are to be effective in finding the sweet spot on the crest of the inverted U at which training load is just right for maximum performance and/or health, we also need to understand something about the sweet spot in the mind. As described in last week’s post, it is likely that the key to understanding both the over-training syndrome and the health risks of excessive training is an understanding of the mechanism of inflammation. In addition to the various local chemical messengers such as the molecules known as cytokines that act at the site of muscle damage to mobilize the inflammatory response, two of the body’s major long distance chemical messenger systems play a crucial role in adjusting the overall reaction of the body (and mind) to the stress of heavy training. These two hormone systems are the hypothalamo-pituitary-adrenal system (known for short as the HPA axis) which regulates the release of the hormone cortisol from the cortex of the adrenal gland, and the adrenergic system which regulates the release of adrenaline from the adrenal medulla. The adrenergic system is a part of the autonomic nervous system which plays a crucial role in regulating many visceral functions including the heart rate, as well as engaging in reciprocal interactions with the mind. The HPA axis also regulates many body systems, especially the immune system, and it too engages in important reciprocal interactions with the mind. One of the manifestations of the interaction with the mind is the phenomenon of depression. Perhaps depression is to the mind what inflammation is to body. It is a response to stress or trauma that mobilizes repair, but it can get out of hand and become a chronic disabling illness. In part this is an analogy, but the overlap is not purely analogy: both the adrenergic nervous system and cortisol play an important role in the response to stress, and both are involved in inflammation and in depression. Depression is associated with increased levels of cortisol and with a failure of the normal feedback mechanism by which the brain regulates the release of cortisol from the adrenal cortex. The interaction between cortisol and depression is reciprocal: the fact that synthetic corticosteroids used to treatment many immune system disorders can cause depression, and that diseases such as Cushing’s disease in which the adrenal gland produces too much cortisol, can result in depression, confirms that corticosteroids can cause depression. However, depression arising from other more overtly psychological causes results in elevated cortical and impaired HPA axis function, illustrating that the arrow of causality can point in either direction. So it is plausible that depression has evolved, alongside inflammation, as a component of an integrated mechanism for dealing with stress and/or trauma. Neither acute inflammation or depression are pleasant experiences, but provided that they do not get out of hand they are both potentially beneficial. How might depression be beneficial? Perhaps the most direct way is via the inhibition of unnecessary activity. Depression produces slowness and lethargy of both mind and body. For the athlete this scarcely seems a benefit, but as we discussed last week, the most important requirement for obtaining benefit from training is ensuring adequate recovery. A mechanism whereby heavy training induces a state of reduced activity is in fact exactly what is required. Post-training lethargy only becomes a problem when it is excessive and prolonged –it is probably the earliest and perhaps most reliable indicator of the onset of over-training. Depression has other features: in the early stages there is self-questioning and re-appraisal. Like inflammation, it is associated with increased musculo-skeletal soreness – another early sign of over-training. Humans are social creatures and it is probable that depression serves social roles as well, roles such as the facilitation of empathy and bonding. These various beneficial roles of depression reflect the adaptive side of the condition. Like the manifestations of inflammation, these benign influences can rapidly turn malignant once depression crosses the boundary separating a transient adaptive response from an entrenched illness. The self-questioning is replaced by loss of self-confidence, guilty feelings and pessimism. There is loss of enthusiasm and enjoyment; poor appetite and disturbed sleep. It then becomes a clinical problem requiring treatment. The POMS assessment assigns scores to six aspects of the mental state: Tension, Depression, Anger, Vigour, Fatigue and Confusion. These scores are usually represented with the scores for the six items arranged horizontally across a chart. A healthy fit athlete usually has a marked peak for Vigour and low scores for the other five items, apart perhaps from a mild elevation of tension. So the chart has the appearance of a single iceberg protruding above a fairly calm sea. However, as the over-training syndrome develops the sea becomes more choppy and eventually a ‘reversed iceberg’ appears, with two pronounced peaks corresponding to Depression and Fatigue while Vigour has descended into a trough. 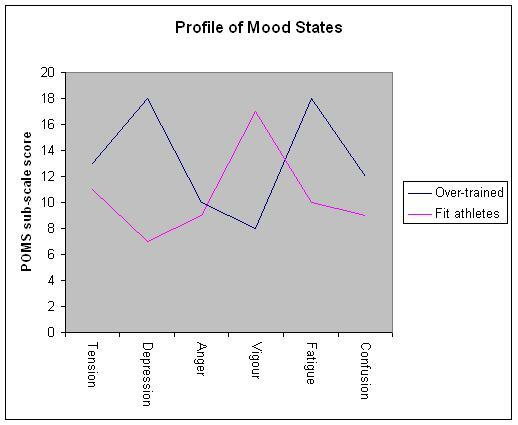 I do not think it is appropriate for an athlete in training to perform regular POMS self-assessments (the full version of the scale has 65 items), but I think it is important to be alert to the emergence of the sub-clinical features of depression Of course, like all physiological markers for over-training, features of depression must be evaluated in light of other circumstances and the individual’s usual state – it is changes from usual that matter. Furthermore, the mind is quite capable of self deception: obsessional determination to complete every planned item in the training program in the face of evidence of accumulating fatigue can be just as dangerous a marker as a lack of enthusiasm for training. In summary, in avoiding over-training, perhaps listening to the mind is even more important than listening to the body. However, the mind is capable of all sorts of devious tricks by which we can fool ourselves, so listening to the mind is only a reliable guide if we develop the ability to appraise our own mental state accurately. Inflammation, heart rhythms, training effects and over-training. The interesting comments by Thomas, Rick, Paul and others during the past week on my post discussing atrial fibrillation, confirm that disturbances of heart rhythm are common in athletes. These disturbances range from benign forms of supra-ventricular tachycardia (SVT) to the much more dangerous ventricular tachycardia (VT) that originates in a rogue site in the walls of the ventricle. SVT, which arises from an aberrant source above the ventricles (i.e in the atrium or in the walls of the pulmonary veins) is less dangerous than VT on account of the modifying influence of the atrio-ventricular (AV) node. The AV node is the gateway through which the electrical impulses that drive contraction pass from atria to ventricles. There is an upper limit to the rate at which the AV node can transmit impulses, so in cases of SVT the ventricles are protected from extreme rates. On the other hand, VT can cause the ventricles to contract at rates so high that efficient filling is impossible and the ventricle rapidly becomes exhausted and fails. The AV node also prevents the chaotic contractions of atrial fibrillation (AF) being transmitted to the ventricles. However, AF creates a different risk. The chaotic atrial rhythm can lead to pooling, and subsequent clotting, of blood in a recess of the atrium known as the atrial appendage. If the clot breaks free and subsequently lodges in the brain, it can cause a stroke. The dangers of an abnormal rhythm in an individual case depend on various associated risk factors, but as a rough guide, SVT, AF and VT present an increasing hierarchy of risk of serious consequences. Paul drew attention in his comment, to two of Australia’s greatest triathletes, Greg Welch and Emma Carney; both winners of multiple world championship events; both of legendary toughness, whose careers were abruptly terminated by VT. Perhaps this was coincidence, but in light of the evidence I discussed last week indicating the risk of AF is increased by endurance training, it is natural to speculate that endurance training might play a role in all three of the classes of rhythm disturbances: SVT, AF and VT. It is crucial to open any speculation on this issue with a caveat that in general, keeping fit increases life expectancy. Today I will examinee the evidence that the mechanism by which physical exercise strengthens the heart is intimately related to the mechanism by which it might produce long term damage. If this is the case, it is crucial to understand the nature of the relationship between these intimately related processes in the hope that we can maximize the benefits while minimizing the risks. I believe the key to understanding the paradox is inflammation. This is a hypothesis; it is not a proven fact, but I believe the evidence is sufficiently strong that it I am using this hypothesis to guide my own judgment as I seek the optimum balance between benefits and risks of endurance training. Inflammation is the response to tissue damage that initiates repair. It is essentially a protective process that entails a complex cascade of biochemical and cellular events triggered by tissue damage, that mobilize a set of processes that limit the damage, clean up debris and promote healing. Cells in the vicinity of damage release various substances, including immune system mediators and messengers known as cytokines, that coordinate a complex set of reactions, including increased flow of blood to the regions of damage, and an increase in the permeability of the walls of small blood vessels allowing white blood cells to leak into the surrounding tissue. These white cells include neutrophils and lymphocytes responsible for the immune reactions that limit cellular damage, and macrophages that mop up cellular debris. Various biochemical mediators mobilize cells that promote healing and hypertrophy. For example in skeletal muscle, it appears that a class of cells called satellite cells (primitive muscle cells) are mobilized and fuse with existing muscle cells resulting in hypertrophy. However the repair processes do not always result in a strengthening of functionally useful tissue. It can also result in the development of a fibrous scaffold that confers mixed blessings. In the short term, fibrous tissue might play a useful role, but in the longer term, replacement of previously functioning cells by fibrous scar tissue is likely to result in a loss of function. The immediate response to acute tissue trauma is a transient inflammatory response that is manifest as redness and local heating due to increased local blood flow, swelling due to leakage from blood vessels, and pain if the tissue concerned has a rich supply of sensory nerve terminals. Although temporarily inconvenient and sometimes even disabling, these processes are essentially beneficial as they reflect the mobilization of the healing process. However, inflammation can become chronic, either due to repeated trauma without adequate time for the healing process, and/or due to derangement of the immune system that results in auto-immunity – an attack by the immune system on one’s own body. Chronic inflammation can affect many different types of tissue. One form of chronic inflammation that appears increasingly common in athletes is asthma – an over-reaction of the defense mechanism in the small airways of the bronchial tree, resulting in shortness of breath and wheezing. In rheumatoid arthritis, chronic inflammation affects joints and can also affect the heart. There are also other causes chronic inflammation of the heart muscle ( chronic myocarditis) such as the aftermath of bacterial infection. Chronic inflammation is generally more harmful than beneficial, and the possibility of converting acute inflammation to chronic inflammation provides a very strong reason why one should not exercise when exhbiting systemic (ie generalized) signs of infection, such as fever. In light of the evidence for increased risk of occurrence of heart rhythm disturbances in athletes, it is perhaps important to ask whether or not endurance training might produce sub-clinical inflammation of the heart that has significant effects on function, either for better or for worse. But first of all, it is informative to consider what we know about inflammation, healing, and hypertrophy of skeletal muscle following vigorous exercise. The consequences of tissue trauma can be visualized by using an electron microscope to examine skeletal muscle tissue acquired via muscle biopsy. In my post on April 12th 2009, I discussed the evidence that running, especially down-hill running, can produce visible disruption of the points where the actin and myosin chains are attached to the framework of the myofibril. This overt evidence of structural damage is known as Z-line streaming. (For photographs, see for example, Gibala and colleagues, Journal of Applied Physiology, Vol 78, 702-708, 1995). It is possible that it is due to shorter myofibrils being torn asunder by the powerful contraction of adjacent longer fibrils in the same bundle. Such damage would be expected to release chemical messengers that initiate inflammation. It is plausible that less severe tissue trauma will result in the activation of chemical messengers even without such dramatic disruption of the myofibrils. In particular, reactive molecules known as free radicals can be produced as a consequence of the degradation of the high energy molecule ATP, that is the immediate fuel for muscle contraction. Free radicals can produce damaging oxidation of tissues. The factors that determine the balance between potentially harmful processes such as mechanical disruption or damage by free radicals, and constructive strengthening, are not clearly established. The observation that athletes have a limited period at the very top of the rankings suggests that extreme training might produce a gradual accumulation of free radical damage or fibrosis. But perhaps this is not inevitable. Perhaps the long term deterioration is only the consequence of occasional episodes when athletes push themselves too far – it might be possible to remain consistently very near the top of the rankings by judicious adjustment of training that recognizes when it is necessary to ease off and allow the body to recover. The relative longevity at the top level of female marathon runners, illustrated by individuals such as Catherine Ndereba, who apparently trains conservatively and has remained consistently near the top of the marathon rankings for almost a decade, suggests that a conservative approach minimizes the risk of long term damage. Heart muscle is less easy to biopsy than skeletal muscle, but it is possible to measure proteins that are released when heart muscle is damaged – one of the most sensitive is cardiac troponin. A level of cardiac troponin greater than 0.05 micrograms per litre detected in the blood is regarded a marker for an acute heart attack. However, endurance events also produce an increase in troponin in the blood. This was dramatically illustrated is a study of blood levels of troponin in 29 cyclists completing the Otztal Radmarathon in 2004. This challenging 238 km marathon involves 5,500 meters of climbing over 4 alpine passes (Kuhtai, Brenner, Jaufenpass and Timmelsjoch). Cardiac troponin was not detectable in the blood of any competitors before the race, but afterwards 45% of the cyclists exhibited detectable levels, with 8 (28%) individuals having values in the range 0.043 to 0.224 micrograms /litre (Neumayr G et al. Effect of competitive marathon cycling on plasma N-terminal pro-brain natriuretic peptide and cardiac troponin T in healthy recreational cyclists. Am J Cardiol. 2005 ;96(5):732-5.). However the levels had returned to normal within one day, leading the authors to conclude that the effects were due to cardiac muscle fatigue rather than overt damage. Perhaps more relevant to athletes who engage in less extreme events, a study of 72 non-elite competitors in the London marathon in 2002 and 2003 demonstrated that 56 (78%) had a detectable rise in troponin levels after the event (Shave et al, Heart, 2005; 91:1219–1220.). Of the 76 runners, 26 (36%) had a level above 0.05, the level regarded as indicative of an acute heart attack Thus the proportion of non-elite athletes exhibiting post-marathon troponin levels in the range conventionally regarded as indicative of a heart attack was actually slightly higher than the proportion in cyclists completing the Otztal Radmarathon. Although levels of troponin were not measured on the day following the London marathon, the evidence from the study of the Otztal Radmarathon suggests that it is likely the elevation of troponin was only transient. It is unlikely that the increased levels reflected overt damage to cardiac muscle. Most heart attacks involve local damage to a relatively small volume of heart muscle that has been acutely deprived of blood following blockage of a coronary artery: a myocardial infarction. Heart muscle cells in the region of infarction are visible disrupted. It is plausible that in the competitors in the London marathon, a minor degree of leakage from widespread regions of the heart had produced a transient rise in troponin. Furthermore, in both the Otztal Radmarathon and the London Marathon, the rise was seen after relatively sustained exercise – rather than acute burst of high intensity exercise, consistent with the proposal that it is slow leakage rather than dramatic disruption. The crucial question raised by a comparison of the events in heart and skeletal muscle following demanding endurance exercise, is whether or not the transient increase in troponin is actually a marker for a protective process that promotes healing and strengthening; while in contrast, extreme exercise and/or inadequate periods of recovery might result in long term damage. 3) chronic inflammation might underlie the over-training syndrome. Failure to allow adequate periods of recovery from training might result in damage from which recovery is likely to take months or years, and perhaps in some cases might be permanent. This conclusion fits with the accepted wisdom that consecutive days of hard training should be avoided, as should heavy training when there is evidence, such as fever, indicating systemic inflammation. But is there any method other than ‘listening to the body’ to judge when we are in danger of over-training? This is a topic I have addressed in the past. I do not think there is a simple answer to this question, but nonetheless, I will once again turn my attention to the question of systematic procedures for assessing over-training, in the near future. You are currently browsing the Canute's Efficient Running Site blog archives for March, 2010.